After winning a third-consecutive series championship in September, Sébastien Ogier closed out the FIA World Rally Championship season with a third-straight win at Wales Rally Great Britain and his eighth of the season by 26 seconds over second place. But his teammate didn’t have nearly as good of a day. Fellow Volkswagen Motorsport driver Jari-Matti Latvala was the first to wreck out of the race on day one, and it was an ugly one. 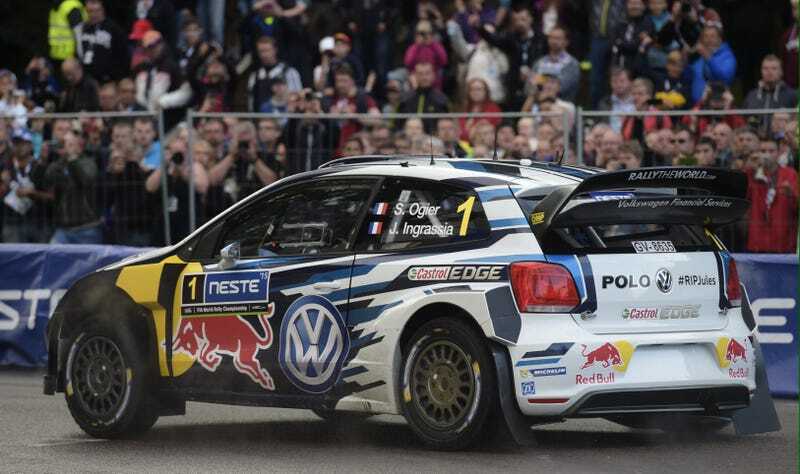 Latvala climbed out of the car OK, ending the day—and season—in the runner-up spot behind Ogier in the standings. A win in the Power Stage at Wales Rally GB ensured that finish in the points for Latvala, but the two-time former winner in the event ended up 51st overall of the 58 entries. The race featured some tough racing conditions, with heavy winds and rain during the weekend that made for some great photography of a throwback Colin McRae paint scheme driven by Subaru entry David Higgins. “We’re happy to finish the season like that from a sporting view, but my mind wasn’t really there this weekend. It was hard to carry on after the tragedy in France and our thoughts were with the people. We wanted this victory as our small sign for those who have been touched, and to show we must be even stronger against these things,” said Ogier.